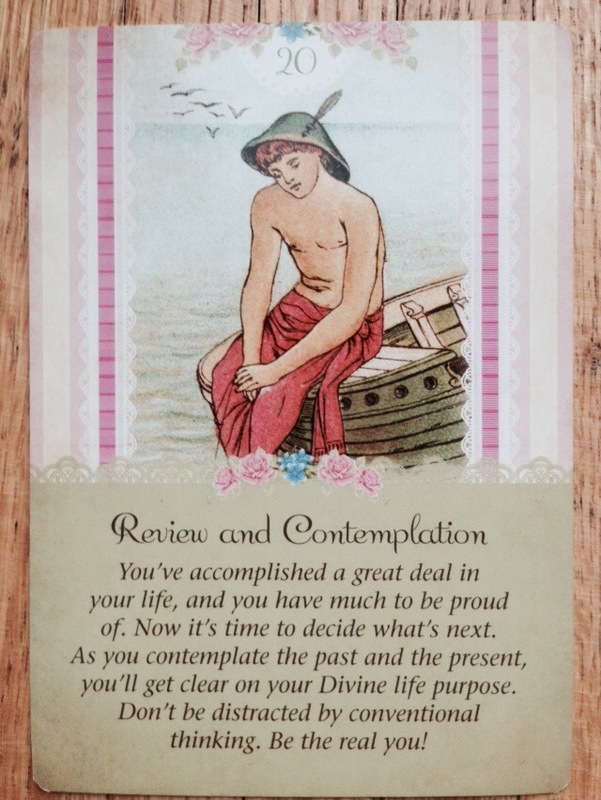 Card: 20 Review and Contemplation – from the Guardian Angel Tarot Cards by Doreen Virtue and Radleigh Valentine. Message from the Faeries: As we always do, we are asking you to take this time this week to think deeply about which direction you would like to see your life going in. What is it that you really, really want? Who do you see yourself becoming? Be very, very honest with yourself. Have zero shame or fear of who this person is. You’ve accomplished so much, so far, in your life and you should be proud to the very core of all the great things you’ve achieved. Respect and honour everything that has lead you up to this very moment, for every moment is a moment of greatness. This is not the time to wallow in pity or to feel sorry for yourself. You are great and your life is a miracle-blessing. You are your own greatest achievement. After you have acknowledged all of your accomplishments, we would like you then to imagine yourself over the next few months and the direction you feel yourself being pulled towards. Ask yourself if this is really, truly where you want to be. It’s great if the answer is yes, and it is great if the answer is no. If the answer is yes, keep going the way you are going. If the answer is no, do not feel guilty or bad at all! You are exactly where you are supposed to be in this very moment, but it’s now time to go in a different direction then you had anticipated. This might rock the boat a little, but that’s quite alright. This is your ride and you are the captain. Sail to where you feel the winds blowing you. We can feel and see that most of you are at this crossroads that you weren’t expecting to encounter. You thought you wanted something, but it turns out it isn’t what you really want. Perhaps you were relying to much on the guidance of others, or maybe you weren’t searching deep enough. Sometimes it’s difficult to be honest with yourself about what it is truly that you desire. Regardless of the reason for the change of heart, feel the excitement deep inside you, for this new course of action is going to bring you so many new and wonderful opportunities. Change is good – always! Note from Erin: I got this tarot deck this week and I have to say it’s the most sweetest and gentlest deck ever. It’s great for people who might be a little afraid of tarot, but still want to explore it a little. I highly recommend it. This entry was posted in Faerie Reading and tagged angels, choices, doreen virtue, Faeries, fairy, guardian angels, honesty, life, Tarot by faeriemessenger. Bookmark the permalink. Thank you Erin. This reading is spot on for me. I’ve definitely been having a change of direction after trying to do what I thought others would appreciate.